Betty LaDuke’s 65 year career as an artist has spanned continents focusing on concerns of the human condition. 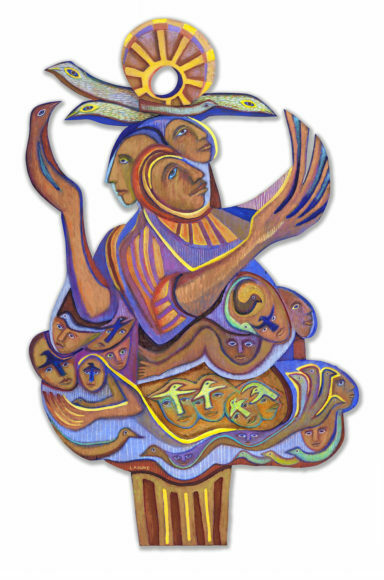 Informed and inspired by Mexican muralists, LaDuke’s panels stand on their own in style and purpose. While often speaking to the trials that humans face, there is also a celebration of spirit present in each large, vibrantly painted panel. February’s exhibition at Hanson Howard Gallery will include giclee prints from the original panels of Betty LaDuke’s series, “Bountiful Harvest” as well as a current series titled “Border Crossings” and beginning sketches of a new project underway concerning the water protectors at Standing Rock which will all be available for purchase. We will also have several new original panels from “Border Crossings” on view but not available for purchase at this time. Beginning by spending time sketching activities on the local farms, the panels of Bountiful Harvest, From Land to Table illustrate and celebrate the workers who plant, tend and harvest our food here in the Rogue Valley. Border Crossings is a symbolic portrayal of the emotional anguish experienced by mothers, children and families as they desperately seek refuge from violence, hunger and despair. In these panels mothers both embrace their children and let go, as the future of their sons and daughters is uncertain. But the mothers continue to hope for better life opportunities for their children. Join us for an artist’s reception Friday, February 3rd from 5-8 p.m.